We hope to see you in 2019! Check back in mid- to late-2019 for tickets! Create a unique family Christmas memory aboard the Grapevine Vintage Railroad&apos;s North Pole Express®, presented by Great Wolf Lodge. One of the most popular Christmas Capital of Texas events, families and children of all ages will enjoy this one-of-a-kind Christmas experience. The experience begins at the Historic Cotton Belt Depot platform where riders board the beautifully decorated rail coaches. As the train departs and the anticipation of arriving at the North Pole builds, Santa&apos;s helpers will welcome the guests and sing traditional Christmas music. While aboard the North Pole Express®, guests receive a Memory Mug of Santa’s special Frosty Chocolate Snow Milk and a delicious Christmas cookie to enjoy during the journey. At Reindeer Ridge, Mrs. Claus boards and presents each child with a “We Believe” bell. After the train arrives at the North Pole guests walk through the snowy North Pole Forest as they enter Santa’s workshop, where a cast of Santa’s helpers perform traditional Christmas musical numbers and share the joy of the season. Santa performs, sharing the joy and spirit of Christmas and wishes everyone a Merry Christmas. Following this magical Christmas performance, and also included in the price of your ticket, all guests will receive a voucher to take a complimentary photo with Santa, which is placed in a commemorative photo jacket. This voucher can be redeemed at any time during the North Pole Express season. Limit one per family. 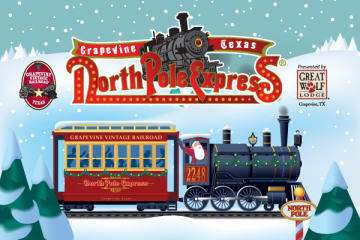 We are excited to welcome your family and friends to the North Pole Express and to Grapevine, the Christmas Capital of Texas. Advance purchase recommended. North Pole Express® tickets are $28.50 per passenger over the age of 12 months. Please allow a minimum of 30 minutes for the shuttle to bring you to the North Pole Express® neighborhood. Passengers should be in the North Pole Express® boarding line 15 minutes prior to their ticketed boarding time. Infants (0-12 months) that are issued a complimentary ticket must be held in an adult&apos;s lap. For safety reasons, strollers, infant car seats and carriers are not allowed on the train. All tickets are non-refundable and non-exchangeable. Missed trains will not be refunded. 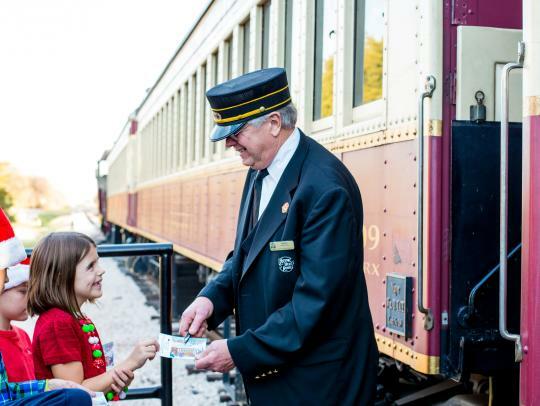 Minors under the age of 18 must be accompanied by a parent or legal guardian on all Grapevine Vintage Railroad excursions. Please note, due to mechanical requirements, engine and equipment changes may occur without notice. The Memory Mug of Santa’s special Frosty Chocolate Snow Milk and a delicious Christmas cookie will be served on the train this year. Adults bringing a child under 13 months old must purchase an "Adult with 0-12 month old child (must be held on lap)" ticket.